Just like routine maintenance on your car to prevent larger problems, like an oil change, everyone needs routine maintenance on their teeth and gums. Even if you brush and floss twice every day, a dental visit is still required to identify any larger issues and preventing them from happening. Regular visits help to keep your teeth and gums at optimal health and provide a cleaning that you can’t get from at home maintenance. Here are some reasons regular dental appointments are so important. Signs of gum disease are hard for the average person to detect on their own. Regular dental visits are key to identifying issues before they become more difficult to prevent and treat. Gum disease is caused when tartar builds up and causes an infection in the gum tissue and it eventually ruins the connective tissue of the gums, causing them to pull away from the teeth. If you let it go too far, it can cause periodontal disease, which breaks down your teeth. Gum disease is also closely connected with diabetes. It really is important for your overall health to see the dentist regularly. Plaque can build up and create tartar, which is a solid that is hard to get rid of. Since plaque and tartar are so damaging to your oral health, it is important to have regular dental visits to get rid of plaque and tartar that brushing and flossing can’t get. Dentists have special tools that they use to get the stuff you miss while brushing and flossing. Regular cleanings are a great tool for the prevention of tartar build-up and prevent other problems. Cavities are caused by tartar that has built up over time and has eroded the tooth. Cavities rarely have any warning signs, so going to the dentist regularly is the best way to prevent them before the tooth has already decayed. Once the tooth has decayed, that’s when most people begin to have discomfort or pain. At that point, it is already too late. Regular dental visits can prevent you from experiencing a cavity and having to have more visits to get them filled. Sometimes cavities and other problems don’t present on the surface of teeth. 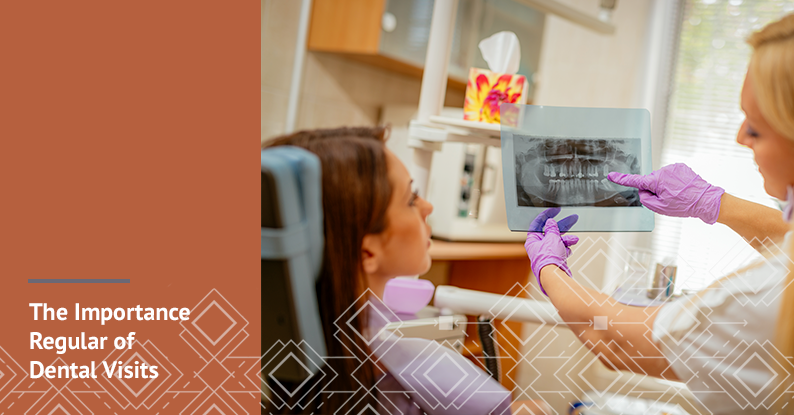 Regular dental visits will give your dentist the opportunity to take x-rays and identify problems that might be under the surface. Problems that lie under the surface may be impacted teeth, cavities between teeth, bone decay, and tumors and cysts in the jaw. These are all impossible to see without an x-ray and are critical to treating as quickly as possible. Regular visits are the best way for your dentist to identify and treat these issues. Don’t wait until it is too late! Schedule your bi-annual appointment today by calling 785.776.0097 or by submitting an appointment request at the top of the page!